This four-year period was characterised by unprecedented changes in organisational structure including accommodation moves, policy initiatives and project directions. Mark Imhof succeeded J. Martin, who retired in April 1993 but continued in a voluntary advisory capacity as “visiting scientist”. M. Imhof had the task of maintaining and promoting interest in all aspects of soil science and applied pedology within the context of these relatively dramatic changes. With the anticipated move of State Chemistry Laboratories from East Melbourne to Werribee the former soils unit staff transferred to the Department's Head Office at Wellington Parade in December 1993, breaking an almost 120 year tradition of accommodation within the laboratories. In the same month a publication of the Department’s corporate planning goals emphasised the protection of agricultural and environmental resources and the enhancement of their long-term productive and profitable use. In support of this initiative a new group, the Industry and Resources Information Section (IRIS) with Mr Bruce Weston as leader was established by February 1994. The aim of this section was to optimise the availability and use of key industry and agricultural resources information to support the Department's core business through the implementation of Geographic Information Strategy and the Statistical Information Strategy. This objective was one of four major work programs and included land resource assessment. Within this program, the major project, under the leadership of M. Imhof was the National Landcare Program funded “Soil Information to support Landcare region activities. Major aspects included (1) identification, description and mapping of soils and landforms in Gippsland, (2) rationalisation of existing mapping in North Central, Goulburn and North East regions, (3) identification and description of major soils for a number of key Landcare and Farm Advance groups within the North Central, Goulburn and North East regions, (4) soil pit field days and workshops and (5) development of the Victorian Soil Site Database (Imhof, 1995). Aspects of these activities were further emphasised in the Department’s Four Year Sustainable Development Program (1994-1998), in which the objectives included the development and promotion of integrated management packages to address key limitations to soil productivity for each main soil type (Anon 1994). Staff involved in these soil pit assessments included: Mark Imhof, John Martin, Paul Rampant, Sonia Thompson, Karen De Plater and Ruth Lourey. 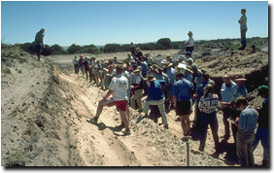 Soil pit field day for Springhurst-Byawatha Hills Landcare Group (1996). The above listed projects resulted in a series of over 30 “booklets” which were prepared for and resulted from a variety of field-based site inspections and soil pit field days carried out in cooperation with a number of Landcare and other landholder groups (eg. Farm Advance groups) across the state. The booklets contained comprehensive site soil morphological and analytical data and emphasised the relevance of the new Australian Classification System and individual soil properties to aspects of soil management. Although mapping was not a major part of these projects there were several exceptions where maps were included with booklets. For the Lowan Shire Land Inventory and Assessment Project 268 000 hectares were mapped at a scale of 1:100 000 (Imhof, Thompson and Rees, 1995). As part of providing soil and land information to assist Landcare activities in SW Gippsland 225 000 hectares were mapped also at a scale of 1:100 000 (Sargeant et al, 1995). This latter booklet also comprised the companion notes for a highly successful (and very well attended) field day (3rd November 1995) conducted in association with the Victorian Branch of the Australian Society of Soil Science. Under new policy and financial arrangements Dr Ian Sargeant worked under contract to IRIS for this project. 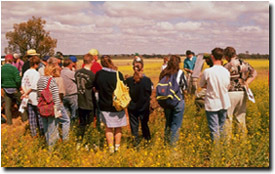 During 1994 and 1995, work carried out by soils staff in support of Department initiatives included assistance in the project, "mapping trace elements to improve grain production in the Mallee". Soil samples collected during the unit's 1992 survey of the Mallee region were used in this project. GIS projects which involved Section members included state-wide small scale mapping of soil root zone potential available water storage capacity, the provisional mapping of agricultural land quality within the Port Phillip region and small scale mapping with regard to suitability for Tagasaste and potato production. In other developments, the IRIS team began the development of placing soil and land information onto the Department's internal website. Much of the information that has appeared in hardcopy soil booklets was subsequently placed onto the website to facilitate greater access to this information. This has also allowed the flexibility of linking soil information to explanatory text and diagrams to facilitate greater understanding. This work has since evolved into the Victorian Resources Online website. By May 1996 further organisational changes had taken place and although many catchment management and sustainable development functions were integrated, Landcare support and the monitoring and assessment of land condition and management remained priority program areas within the newly formed Department of Natural Resources and Environment. Soil activities were then carried out within the Natural Resources Monitoring and Assessment Group within the Catchment Management and Sustainable Agriculture (CMSA) Division. In December 1996 the stated mission of the Natural Resources Assessment Team was to effectively and efficiently provide integrated natural resource information and analysis for priority catchment management and sustainable agriculture programs. Ian Sargeant talking about soils at a West Gippsland soil pit field day. This was to be achieved through resource inventory, resource assessment and resource monitoring and reporting to enable better assessment of key changes in resource conditions. A service purchaser/provider system was to be used. The core purchasing group included M. Imhof as Land Resource Assessment Team leader. In-sourced providers included Ruth Lourey, Sonia Thompson, John Martin, Rob Nink and Kathleen Hirst. Out-sourced providers included Ian Sargeant, Jim Rowan and Ken Rowe as well as other groups within the Department, (eg. the Centre for Land Protection Research). In May 1997, Department staff moved from Wellington Parade to 250 Victoria Parade and the IRIS team as such ceased to exist. With much reduced floor space, it was necessary to relocate most of the historic soil survey hard copy primary data collection (maps, original air photos and field books) to the State Chemistry Laboratory at Werribee and regional Institutes at Tatura and Horsham. Three booklets were produced during this period which had survey as a major component. An early (1967 unpublished) soil type survey of 24 000 hectares in the Wimmera Irrigation area (Martin et al, 1996) was updated in support of the local irrigation salinity management strategy. A large scale soils unit map of some 33 000 hectares was included in the Cranbourne and Koo-Wee-Rup vegetable growing region booklet (Sargeant et al, 1996). As part of ongoing survey project work in West Gippsland Sargeant mapped provisional land units across some 228 000 hectares at a scale of 1:100 000 (Sargeant et al, 1997). Both of these booklets, Sargeant et al 1996 and 1997 were used in successful field days for local growers and district based departmental officers. 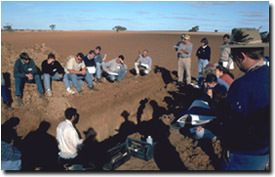 Workshops were held in the field to introduce the Australian Soil Classification (Imhof et al, 1997) and in Melbourne in July 1997 on “Communication Technologies for Land Resource Assessment” (Imhof et al 1997). This later workshop was financially supported by the Australian Collaborative Land Evaluation Program (ACLEP). At this meeting a web-based survey report inventory system was introduced and demonstrated. The Department’s project to update the existing state-wide land system coverage, the need to develop a current geomorphic framework for this purpose and the availability of radiometric coverage of large areas of the state resulted in a study and comparison of interpreted radiometric image patterns and land system mapping units. An initial study suggested that such imagery would assist in the project (Martin, Rowan and Rowe 1997). One essential product of a major Department project “Optimising agriculture and food investments in Victoria through enhanced resource information and area development plans” otherwise known as the Victorian Resource Atlas project (sponsored by Danny O’Neill) would collate statewide and regional natural resources information for dissemination in Web, CD and hardcopy-based formats. Associated activities would require input from trained and experienced soil scientists, field pedologists and surveyors. The Victorian Resources Online website has evolved from it’s beginnings as part of the Victorian Resource Atlas project to become a major means of disseminating soil survey information for Victoria.